Deteriorating economic conditions and the global deficit in quality jobs in many regions, including Caribbean nations, threaten to undo decades of progress in poverty reduction, warns a new report by the International Labour Organization (ILO) in Geneva. What’s more, the report indicates relative poverty in developed countries is increasing. ILO economist Steven Tobin summarized the report’s findings during its release in Geneva on March 18. Tobin said the report provides an estimate of the cost to eradicate extreme and moderate poverty globally. It also offers policy recommendations to address the structural challenges needed to provide both quality jobs and poverty reduction. The report concludes by addressing structural challenges to providing quality jobs and suggests how to reduce poverty, see second story. Using the latest available data, the ILO’s World Employment and Social Outlook (WESO) 2016 – Transforming jobs to end poverty, finds over 36 percent of the emerging and developing world live in poverty – on a daily income of less than US$3.10 purchasing power parity (PPP). The report calculates that some US$600 billion a year–or nearly US$10 trillion in total over 15 years – is needed to eradicate extreme –and moderate poverty globally by 2030. 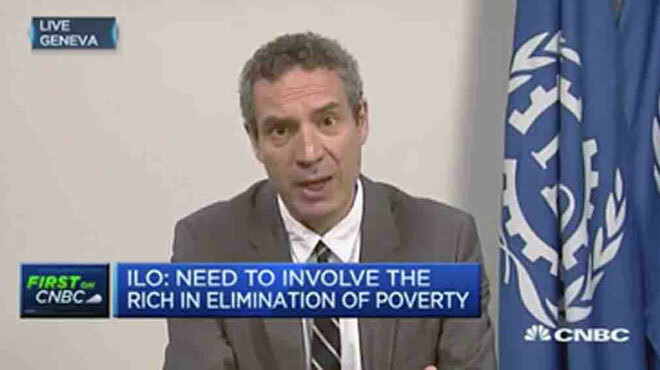 The ILO estimates on poverty reduction come after a sustained period of global progress, with the share of population living in extreme poverty falling from 46.9 percent in 1990 to just under 15 percent among 107 emerging and developing countries. When the moderately poor are considered, the rate has fallen from 67.2 percent to 36.2 percent. But the data demonstrates that progress on poverty has been uneven. Poverty has declined rapidly in middle-income countries, especially in the Asia and Pacific region, but by a much lesser extent in low-income countries, where 47.2 percent of people remain in extreme poverty. In developed countries poverty has in fact increased in recent years, notably in the European Union.